After a great showing for all Laurier Athletics teams this weekend, Jack Moore, Jason Hagholm and Lauren Hunter recapped everything that happened in the sports world revolving around Laurier Athletics. Starting with the men’s football team who are returning back to the Yates Cup for the first time since 2006, coach Michael Faulds returns to the big dance for the first time as a coach. The last time Faulds was apart of the game was back in 2009 when the Western Mustangs and starting QB Michael Faulds fell at the hands of the eventual Vanier Cup champion Queen’s Gaels. The Golden Hawks team showed resilience as they lead the McMaster Marauders 20-6 at the half. Arguably the biggest play of the game was the opening kickoff of the second half where OUA All-Rookie kicker Nathan McLean booted the ball through the end zone to put the Hawks up by 15, a lead too insurmountable for Mac to come back from. 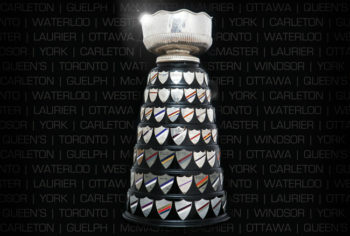 The Yates Cup will be played at TD Waterhouse Stadium in London on November 12th. Kickoff is set for 1:00pm Eastern time and the game can be seen on national television on CHCH. The other big story for the Golden Hawks was their women’s basketball team defeating the No. 7 Ryerson Rams. Down by 1 point with 17 seconds left Nicole Morrison drove to the basket, as the Rams collapsed on her she kicked the ball out to Kaitlyn Schneck who hit a wide open 3-pointer and with 7.6 seconds left the Hawks were up by 2. Unable to convert on free throw opportunities Ryerson fell to the Golden Hawks in a major upset considering the Rams are defending national silver medalists. Hunter, Hagholm and Moore also discussed the woes facing the men’s basketball team and their new head coach who fell handily to the No. 10 Ryerson Rams. Owen Coulthard went 0-15 in the game including a 0-7 look from beyond the three point line. Woes also continue for the women’s hockey team who have yet to find a regulation win so far this season and are relying heavily on the play of their rookies. Another issue facing the team is that goaltender Amanda Smith had a procedure last week and is likely done until January, forcing head coach Rick Osbourne to rest the goaltending duties onto 2nd Lauren Webber. Want to know more about Laurier Athletics? Tune into Hawk Eyes every Monday night at 6:00pm on Radio Laurier.